Montage Mountain is about to get a whole lot sweeter this coming July with the return of the Peach Music Festival! This year's lineup is sure to delight the eyes, the ears, and the soul with its blend of jam, funk, and electronic flavors spread over four days and gorgeous Pennsylvanian grounds. Come and get down at The Peach Music Festival this year, July 25 to July 28 in Scranton, PA! The big headliners at Peach are usually amazing, and this year didn't let anyone down. Phil Lesh and Friends, featuring Warren Haynes, John Scofield, and John Molo have the main headlining spot this year. Attendees can also enjoy two sets of the Trey Anastasio Band and three sets of The String Cheese Incident. I mean - seriously! That right there is enough for a mind blowing festival, but Peach is barely getting started with the headliners. 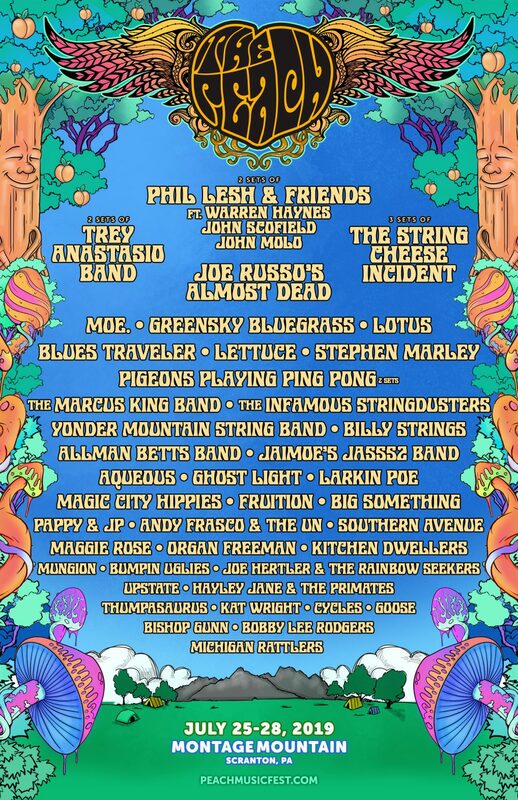 Greensky Bluegrass, moe., Lotus, Blues Traveler, Lettuce, Stephen Marley, The Marcus King Band, Aqueous, Fruition, Big Something…I’m not even halfway done and I am salivating just typing this. Peach this year is absolute FIRE with the lineup! This is a seriously funky, jammy, dance your tush off weekend of music with something for everyone. Montage Mountain itself is absolutely lovely. Right outside the town of Scranton, PA with its fascinating railroad and mining history and gorgeous mountain views, the area creates a dreamy setting for a music festival. The ski area is beautifully green come summer and spread out with enough room for everyone to camp, rock out, and make wonderful new friends. Be aware campers, it is a mountain! The festival suggests packing light with your camping gear as there will be some terrain to cover to get to your campground. It makes that first ice cold beer all the more worth it though once you are settled in. There are several nearby hotel accommodations as well for those who prefer a bed over sleeping under the stars. Tickets are rolling out right now for the festival. You can find all the ticket information needed right HERE on the festivals website including passes for camping, glamping, travel packages, and general admission to the festival.